Comics 4 Movie Fans: Who is Klaw? Marvel’s recent announcement about the start of principal photography on Black Panther included an extensive cast list with mostly new names, new character additions to the Marvel Cinematic Universe (MCU). Though there are no Avengers in sight, a few familiar characters will be joining Chadwick Boseman’s T’Challa in Black Panther. We thought we had seen the last of King T’Chaka, played by John Kani, since his dramatic death in Captain America: Civil War was what propelled T’Challa into action against the Winter Soldier (Sebastian Stan). It’s possible he will only be returning in flashback, but there’s also the possibility he may return as a spirit guide (think Obi-Wan in Empire) since one of Black Panther’s abilities in the comic books is that he can commune with his deceased ancestors. Another familiar character is Everett K. Ross, played with aplomb by Martin Freeman in Civil War. As Deputy Task Force Commander of the Joint Counter Terrorist Centre (JCTC), Ross was the one who took custody of Helmut Zemo (Daniel Brühl) from Black Panther and offered him an office, rather than a jail cell. It’s likely that Ross will appear as an irritant in Black Panther because of T’Challa’s decision to grant asylum to Captain America (Chris Evans) and Winter Soldier in his home nation of Wakanda, rather than turn them over to the JCTC. Finally, there is Ulysses Klaue, one of the rare non-motion capture characters played by Andy Serkis (Gollum in Lord of the Rings, Caesar in Planet of the Apes, Supreme Leader Snoke in The Force Awakens). Klaue is familiar to movie fans as the greasy, pompous Belgian selling black market arms out of a dilapidated ship in a South African salvage yard in Avengers: Age of Ultron. Moviegoers will remember Klaue as a cunning and ruthless man capable of facing off against Quicksilver (Aaron Taylor-Johnson) and Scarlet Witch (Elizabeth Olsen), but a man nonetheless. When he angers Ultron (voiced by James Spader) by comparing him to Tony Stark (Robert Downey, Jr.), Klaue is easily dispatched by the killer robot, kicked down a flight of stairs after having his arm chopped off, only to scuttle away and leave his soldiers to do what he could not. Why would Klaue be returning in Black Panther and what threat to the King of Wakanda could he possibly be, especially now that he’s bereft of an arm? Movie fans will remember that Ultron transferred billions into Klaue’s account before delivering the aforementioned beat down. That’s enough money to assemble a small army or purchase some of that scavenged Chitauri tech that we’ve seen pop up on Agents of S.H.I.E.L.D. and in the Spider-Man: Homecoming trailer. But it’s Klaue’s history as “Klaw” in Marvel Comics that make him a really interesting threat to T’Challa in the upcoming movie. Rather than Helmut Zemo killing T’Chaka and framing the Winter Soldier for the deed, it was Klaw who killed the Wakandan king in the comic books. A brilliant physicist, Klaw needed the rare element Vibranium, found only in Wakanda, to power a sound transducer capable of converting sound waves into matter. 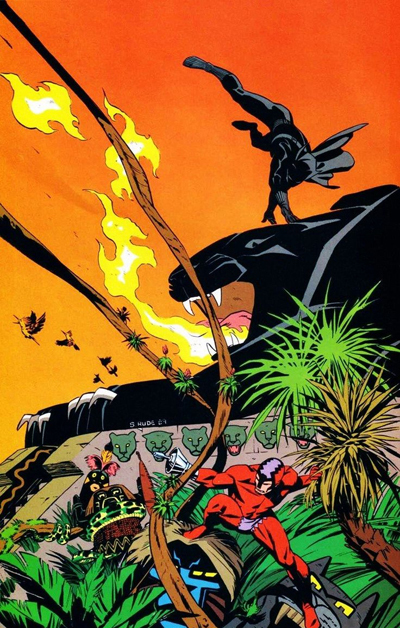 When T’Chaka refused to give it up, Klaw had the king killed and burned his village to the ground. T’Challa managed to get the sound transducer away from Klaw and turned it on its creator, obliterating his hand. After a failed attempt to defeat the Black Panther using a new sonic converter, Klaw turned the device on himself, transforming his body into a state of pure, living sound. Klaw no longer needed to eat or even breathe and became virtually indestructible, capable of reassembling himself at will if his body was damaged in any way. Coupled with his prosthetic hand weapon, which can blast concussive sound waves and create sound constructs, Klaw became one of the Black Panther’s most dangerous adversaries and the eternal enemy of Wakanda. 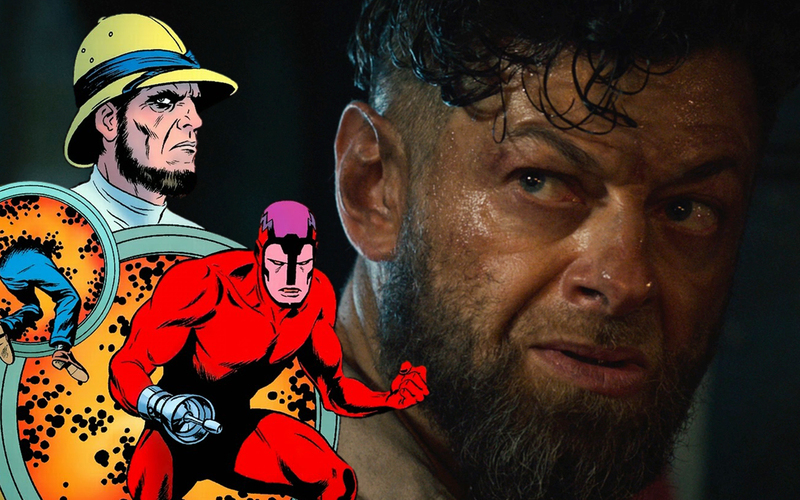 With Marvel’s penchant for toning down some of the zanier costumes and abilities of characters when adapting them for film, it’s highly unlikely we’ll get to see Klaw’s trippy red spandex costume on the big screen, but Serkis’ Klaue wielding some sort of prosthetic sound weapon would fit right in with the tech-centric MCU and make him a villain worthy to battle the Black Panther. Black Panther is slated to open on February 16, 2018. Awesome article! I had no idea that Klaue was anyone important let alone a major villin.